This is my Shimmy for chimichurri dressing. I want to shimmy my way across the kitchen to get it out of the fridge! I recently posted a chimichurri sauce I make all the time and as I was eating it, I realized I’d never made a dressing out of this sauce. One of the ways I eat chimichurri is I dollop some in my salad and mix it around with my fork. So a dedicated dressing is naturally the next progression. In fact, have your tastes changed over the years? I’d love to know because mine definitely have. I like all of the above now, where I never used to. And they are all equally surprising to me. Now, I prefer my oil and vinegar dressings over creamy ones. (Move over, blue cheese!) However, I never would have thought that possible. But it is. This chimichurri dressing tastes like the sauce only better. It’s probably the extra oil. But, before I continue, I’d like to tell a story. Mazeppa’s gimmick was her trumpet. One of the funny things is that when she cast me in this role, the director didn’t know I knew how to play the trumpet. After she found out we decided that I would sing my portion of the song as is customary but near the end of it, I’d lift the trumpet and play a little ditty. Most other actresses who play Mazeppa pretend to play the instrument while the trumpet player in the band plays the music. So it was great fun for me every night when the audience figured out that I was playing the trumpet live. They usually erupted in laughter and applause. So fun! What does that have to do with Shimmying? Below is a photo of me from the show. This is a photo of a photo, so it’s not the clearest! But you will notice my bra and those little black things hanging from it. Those are tassels. So, when I used to shimmy, I could get the tassels to twirl around in different directions. Yes, I know. I have hidden talents. 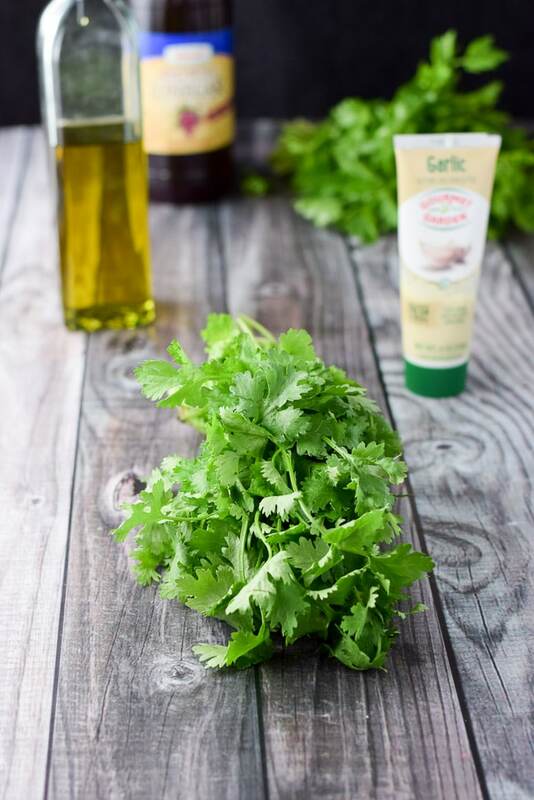 The photo above shows some the ingredients for the chimichurri dressing: cilantro, parsley, garlic paste, olive oil and balsamic vinegar. I pull out my food processor and add 1 cup of packed cilantro, as well as 1 cup of packed parsley, to begin with. I also add 1 cup of extra virgin olive oil, 1/2 cup red wine vinegar, 1/2 teaspoon salt and 1/4 teaspoon ground cumin. Next, I turn the food processor on high for 2 minutes, until the ingredients are smooth. Here is the delicious chimichurri dressing. We poured this delicious chimichurri dressing on our garlic shrimp salad! So, I hope you enjoyed this recipe! 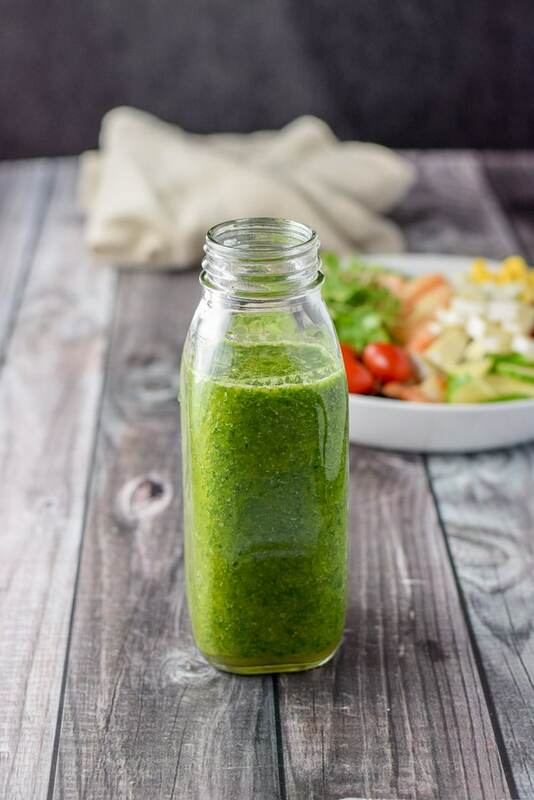 If you’ve tried this chimichurri dressing or any other recipe on the blog, I’d love the hear what you thought about it in the comments below. I love hearing from you! You can also FOLLOW ME on FACEBOOK, TWITTER, INSTAGRAM and PINTEREST to see more of my delicious food and delightful cocktails! This dressing is so delicious on any salad! Truly! My new fave salad dressing! Definitely worth shimmying for. Your bit about shimmying and tassel twirling in Gypsy made me erupt into gales of hilarity. You are a woman of many talents!! I am all about chimichurri ANYTHING. So if you tell me I’ll like it on salad, I’m very, very sure that you’re right. I can’t wait to give this a try! 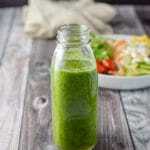 What a lovely, easy, flavourful dressing recipe! It’s such an appetizing colour too! 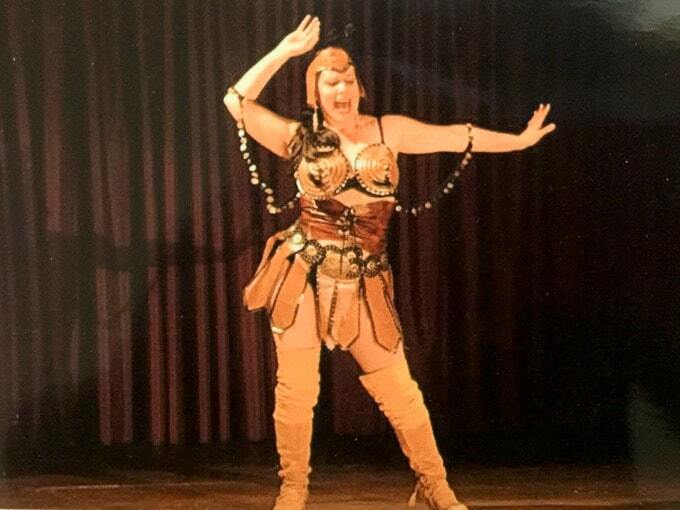 Loved the photo of you from Gipsy – what fun that must have been! Thank you April and yes, it was a blast!! I love chimichurri but you’re right it’s a great idea to make it into a dressing. Ayngelina! Thank you so much! Such a fun post to read!! The dressing looks fabulous…love how fresh and delicious it is! This dressing sounds so good and easy to prepare. Pinning so I can try this soon. Love the photo of you. So Cute! Oh how I love these chimichurri sauces, yours looks faaaaabulous! Love the photo of your show too, wish I’d been there, you look fantastic! Hehe. Thanks so much Patty! You got talent, I love the story of the trumpet. The dressing is very interesting and perfect for a fresh summer salad. Much better than a creamy dressing. I like the combination of the herbs with the balsamic vinegar. Food processor at hand it is so easy to do. Love this one! Such a gorgeous flavor profile! Thanks Beth! I appreciate it!